On Nov 11, 2018 Sunday, Veterans Day, Stonebridge honored all its resident veterans. 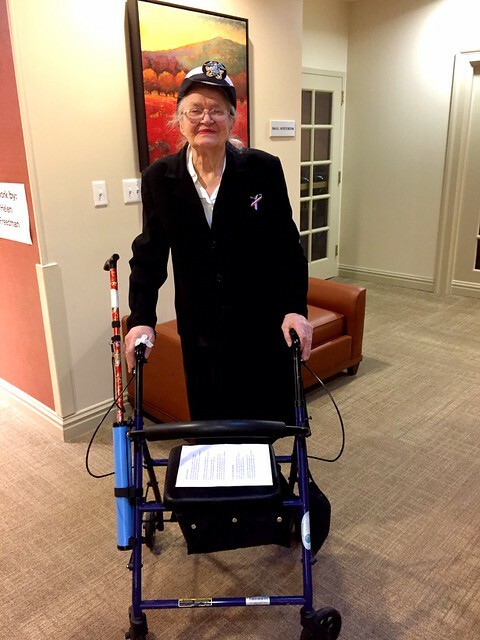 WCCP member Barbara Johnson, her husband John was honored for his navy service in WW2. 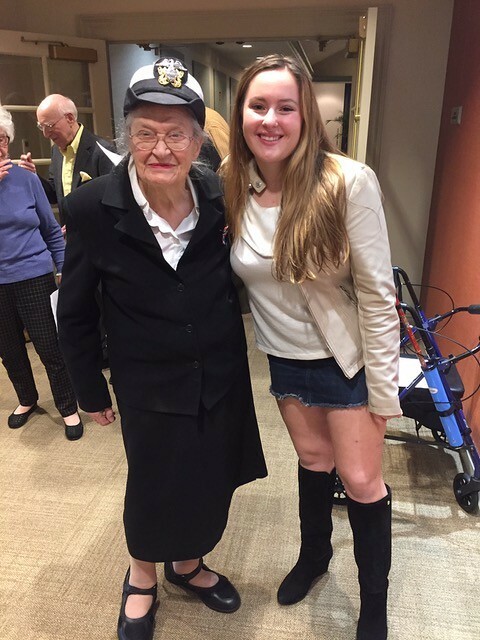 One of our WCCP members, Frieda Gilvarg, sailed in in her full WW2 WAVE uniform, much to everyone’s surprise and pleasure. She was the hit of the afternoon, especially that she still has the uniform and it still fits. Elizabeth (Betty) Baran, a WCCP member, worked with Frieda at Burgdorff Realtors for several years but never knew Frieda, a lovely lady, had been in the service. 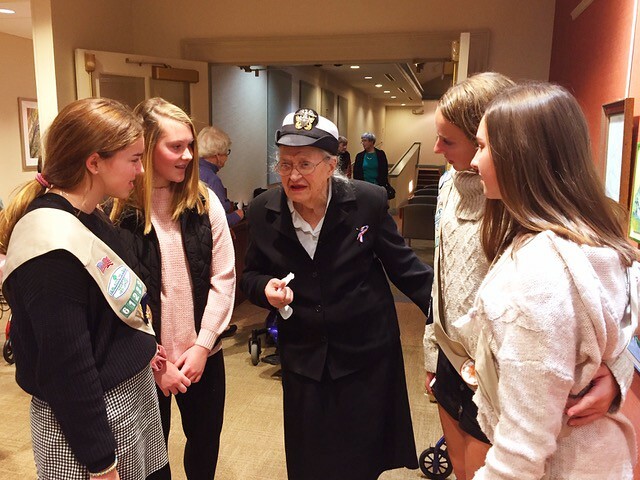 Frieda Gilvarg, one of the Club’s great originals, is one of the four College Club members who are US war veterans. 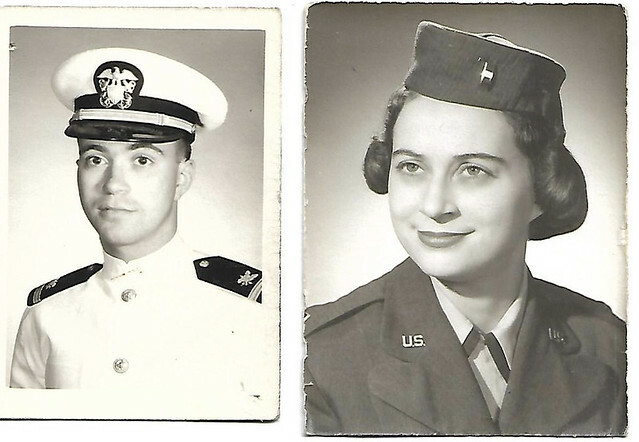 Frieda and two others, Gerry Bowers, and Barbara Broad, all three served in the Navy. 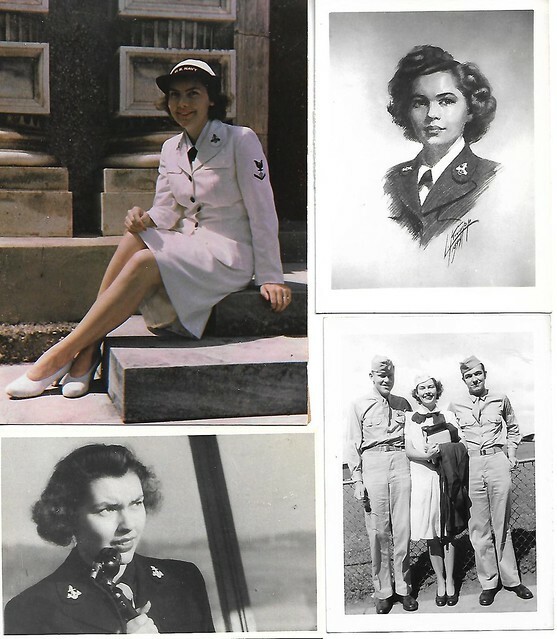 Mary Frances Stahler served in the Air Force. Let’s now celebrate our very much present wonderful veterans, Frieda Gilvarg, Gerry Bowers, Barbara Broad, and Mary Frances Stahler – vibrant, funny, energetic women who served their country and this club and still do. They deserve more than a salute, but we should send them one anyway. We all thank Frieda, Gerry, Barbara, and Frances for their services. Below are Barbara Johnson’s wonderful pictures of Frieda Gilvarg at the Stonebridge reception. Below: Photos of Gerry Bowers: provided by Gerry. Clockwise from top right: portrait drawing of Gerry; Gerry with her brother Curt Peterson to her right and her husband Fred to her left at the airport in Des Moines, Iowa; Gerry at Control Tower at Atlanta, Georgia; Gerry at Pensacola Florida in her white navy uniform. Below: photos provided by Mary Frances Stahler: right to left– Mary Frances Nagle, First Lieutenant serving with the US Air Force during the Bay of Pigs; her brother Arthur J. Nagle, Lieutenant serving with the US Navy during the Vietnam War. Mary Frances Stahler, WCCP Board member. We will be adding photos of Barbara Broad later. This entry was posted on November 17, 2018 by The Women's College Club of Princeton, NJ in Uncategorized.